The song begins with spoken words about conflict, war, pollution, overpopulation, poverty, crime, and the failure of American politics. You can’t accuse 808 State of apathy any more than you can of subtlety. It’s as heavy handed as the hammering beats and stabbing chords and basslines. It’s in your face. 808 State are a northern industrial dance band that emerged from the 90’s rave scene. Their name is a statement of intent, based on their favoured drum machine. They were formed by a record store owner and two of his favourite customers in 1987, and are still going strong. (Tip: always be nice to people who own record shops). They’re well-known as remixers, re-users, replayers and creators: their acid house remix of Blue Monday was a popular track when they DJ’d at The Haçienda’s Hot nights. They used the bassline from Joy Division’s She’s Lost Control in their track Contrique. They ran a radio show in the 90’s on Sunset 102 and Kiss 102. And the State even composed the title tune for the notorious Channel 4 programme, The Word. They’re also connected via collaborating with other artists on songs. They’ve worked with Bernard Sumner (from Joy Division/New Order/Electronic) in Spanish Heart; with MC Tunes, the Manchester rapper, on various projects, the best-known being The Only Rhyme That Bites; with the lovely Lou Rhodes from Lamb in the track Azura; with Guy Garvey of Elbow in the song Lemonsoul; and, breaking the Manchester lineup for a second, James Dean Bradfield of the Manic Street Preachers in the track Lopez (the Welsh and Mancunians can get on, see). An enduring band, 808 State are a tough electronic machine that has yet to be switched off. 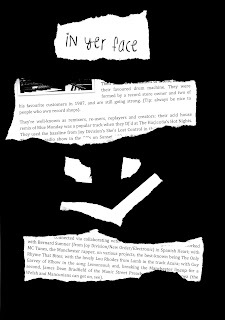 Extract from page 237 of 2000 Tunes: A History of Manchester Music by M. H. Rees; used with permission. Read the whole series (25 extracts) here; or my summary post. Readers might be interested in my forthcoming novel about a man obsessed with Manchester music - confusingly, it is also called 2000 Tunes!